Is the Jury Still Out on Compost Tea? In gardening, as in life, you can’t help but want to love some things, compost tea being one of them. After all, compost is good, tea is soothing, so what’s not to love about compost tea? Perhaps it depends on how you brew your tea. 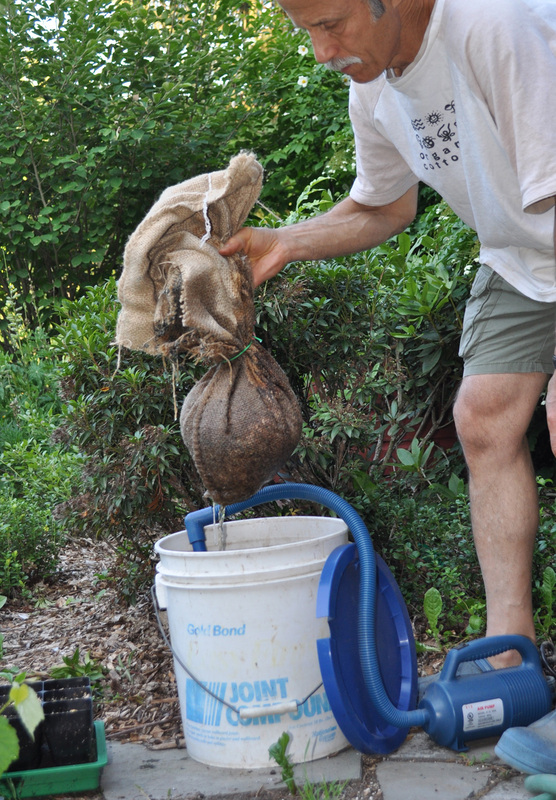 Traditional compost tea was and is made by hanging a burlap bag of compost in water, then diluting and drenching the ground or the potting mix of a potted plant with the nutritious, coffee-brown liquid. More recently, “aerated compost tea” (ACT) has soothed gardeners from coast to coast, the result mostly of the promotional efforts of soil scientist Dr. Elaine Ingham. This tea is brewed similarly to the traditional tea, except that extra foods, such as molasses (honey would seem more in keeping with the tea theme), brewers yeast, and bran, are also added, and — most important — the tea is aerated throughout the brewing process. Brewing up a batch for some plants. The soothing effect from ACT is not nutritional, but biological. You spray the tea on leaves or soil to spread beneficial microorganisms leached from the compost whose populations were beefed up by all that aeration and added nutrients. These happy microbes fight off attack by pathogens and insects, perhaps by making the offenders sick or unable to reproduce, perhaps by making the plants more healthy, or any one of a number of other hypothesized manners. Coming from their home in the dark, moist, nutrient-rich innards of a compost pile, could these friendly microbes really be expected to survive on the bright, dry, nutrient-poor surface of a leaf? And evolutionarily-speaking, when would Mother Nature ever have made provisions for compost, let alone compost tea, let alone ACT microbes, to colonize a leaf and do good there? But this is all speculation; surely someone must have tested whether or not compost tea is really “soothing” to plant life. A slew of gardeners and farmers have tried ACT and can attest to its benefits. Matter of fact, a whole industry is dedicated to testing composts and compost teas, even selling compost tea brewers and compost tea itself. The way to truly ascertain the efficacy of compost tea is to subject it to the same scientific scrutiny as you would anything else: Come up with a hypothesis (such as “Compost tea prevents powdery mildew of squash plants”) and then design an experiment to test the hypothesis. Said experiment would need both treated (compost tea sprayed) and control (water sprayed) plants. Most gardeners and farmers go to the trouble of spraying compost tea because they believe it will be effective, so are not willing to leave a portion of untreated (control) plants. Their endorsements, then, must be taken with a grain of salt, and the same must be said for endorsements from anyone reaping financial gain from compost tea. One treated and one control plant, even one treated and one control plot of plants, would not be sufficient for a good test. Biological systems are complex. Grow 10 tomato plants under exactly the same conditions and some will grow a little more, some a little less than the others. With too few test plants, natural variations in plant growth might overwhelm variation due to a treatment. With enough plants to even out and offer a measure of natural variations in, say, plant growth, effects of a treatment are better parsed out. And finally, randomization is needed to even out any effects of, say, location. Perhaps one side of a plot is more windy, or the soil is slightly different, or there’s a bit more sunlight. Rather than have all the treated plants cozied together growing better or worse because of this added effect, even out these effects by randomizing the location of treated and control plants. I have a friend who is a big proponent of compost tea. Finally, he convinced me to give it a try but only after I made him agree to supply me with a brewer, some compost, and explicit instructions, just to avoid his finding excuses for failure of the tea treatment. A red flag went up when he advised me not to use it in my vegetable garden because it was “too organic.” I ended up, on his suggestion, spraying a few strips down my lawn and parts of some bean rows on a friend’s farms. This admittedly nonscientific test conclusively showed no benefit at all from the tea. So what’s the scientific verdict on compost tea? The answer is not so simple, in part because it depends whether the reference is to traditional compost tea or ACT, the kind of plant, the compost ingredients, how long the tea is brewed, how often tea is applied, etc. Good experiments have been performed, from which the following general conclusions can be made: 1) ACT is not reliably beneficial (and often has a negative effect or spreads human pathogens such as Salmonella); 2) Traditional compost tea has been shown to be often but only mildly beneficial for root diseases; 3) If sufficiently, but not too, dilute, either ACT or traditional compost tea can supply nutrients to feed plants. Mostly, though, I’ll continue to do what I’ve been doing, spreading compost on top of the ground and letting rainwater make the tea. This entry was posted in Gardening, Pests, Soil and tagged activated compost tea, compost tea, Ingham, microbes, snake oil. Bookmark the permalink. Trackbacks are closed, but you can post a comment. Thanks for the level-headed look at this topic. I won’t be able to provide any testimonials to the contrary because, for lack of any reason to do otherwise, I’ve always spread my compost on top, too. I never have enough time to do what I should be doing in the garden anyway, without spending time drowning compost. Way out here in Central Coast California, we have a wicked drought going on (four years on), so our battles compound when we add insects. This year, all my gardening neighbors now have white fly. I am as confounded as they are because neem oil isn’t working well. Because we all live acres apart, I would say we are all reinfecting each other after one clears up the infestation, but it doesn’t seem reasonable at this distance. Is there something more effective (but not toxic to living things) that might work? Anyone got an idea? Weekly sprays of summer oil or insecticidal soap may work, also pyrethrins. I find your logic and scientific method delightful! It’s nice to have an unbiased opinion on the latest gardening fads. Keep up the good work. Thanks Lee! Thanks for doing this work. I have been curious about ACT myself for awhile! Thanks for presenting another look at the compost tea debate. Me? I’m a fan and truly believe that it makes for quicker germination with a higher percentage of germination. Some growing plants seem to respond better than others when sprayed on the leaves. I do have trouble though with incomplete research and theories that shed a guilt trip on users that are not 100% on board. Now if we could only come up with a new “treatment” for a mole repellant. Key phrase there is “truly believe.” Do a test and see if your beliefs pan out. For many, compost tea is a religion. That’s fine. But a lot of religions have different beliefs about the same topic so they can’t all be true. As far as the mole treatment: A few outdoor cats. THAT IS A GOOD THOUGHT.. WE HAVE wet summers, (usually, summer rain, unless the drought from snowless winters makes us wary) that can help the tea leach out. Winter rains also make “tea.” Forget the tea analogy. Just lay compost on the ground and let nature do her work. If there’s not enough water to leach through the compost, there’s not enough water to get plants growing. “Okay, I’ll Try It”??? You didn’t come close to following through on your suggested experiment of “How to Really Test Effectiveness”. What was your hypothesis? What was the condition of the lawn/beans that you were treating? How many applications of actively aerated compost tea (AACT) did you apply? Over how much time? If your soil was biologically active to begin with, you shouldn’t see a difference. If your soil wasn’t biologically active, AACT alone isn’t going to fix your soil issues. Yes, this is a comment from someone in the AACT trade, but I find your comment “Snake Oil, Mostly” an unfair comment based on the information that you provided to your readers about your experiment. You also left out any information about the process that you utilized to create your AACT. Possibly you used an inferior product and/or process. I don’t claim to have done a valid test of AACT; just a lightweight observation. My “mostly snake oil” conclusion comes form an extensive review of the many experiments published in peer-reviewed journals over the last 20 years. Yes, sometimes, rarely, AACT provided benefit; often that benefit was not biologically significant or was under laboratory rather than field conditions. Most of the time the effect was either neutral or negative. Cow and Chicken composted manure TEA is also effective for most all of my plants and FIG TREES. Couldn’t hurt. Just don’t spray on the plant when it’s fruiting and you’re soon to harvest the fruit. You really need a microscope 40-400x to make sure you have the needed sets of organisms in the compost and tea for the plants you are trying to grow. All your plants are covered with mostly beneficial microbes already. Tea just allows you to adjust the populations/diversity when needed. My plants are covered with organisms that survive and thrive in bright light, dryness, and low nutrient conditions — the opposite of what’s found in the innards of a compost pile. With all due respect, I think it’s hubris (of Dr. Ingaham) to purport that enough is known of which microorganisms should be there in what kind of balance. The bells and whistles are fun, though. You have more faith in science that I do. I’ll take the rag tag array of microbes in my compost pile, as I have for decades, over a few species humans have deemed the “best” for plants. My background in science (degrees in chemistry, soil science, and horticulture, and research with the USDA and Cornell University) has, among other things, given me an appreciation for what we do NOT know. I find this very informational, and if you would present the method in which you brew the tea we may be able to find the influencing factor to your failed attempt at ACT. Molasses creates lazy bacteria and if brewed this way negative effects could be observed. Another determining factor on ACT success is PH. You discussed nothing of the sort as being a potential flaw in using tea. I PH my teas before use and use fish protein and kelp to feed a complex array of bacteria and Mykos fungi. To say it doesnt work like snake oil is such a cop out of organics. I have done the control plants with liquid organic nutrients and then had a group of plants sole food source was compost tea. I am using this tea every few days so a negative effect would be quite obvious. After a month of using the ACT appropriately by PHing and using the right food, the plants thrived like nothing I have ever seen before. Super high energy high yielding and very disease free plants. Anecdotal? I think not. To spread misinformation about organics is a crime to your fellow man. Do the work and research to find out if you are doing it right then try it. Trying one ACT method is very likely why you saw little success. Do you work for Monsanto by chance? A few comments: Unless you designed and carried out a careful experiment with control plants, randomization, etc., your “data” is anecdotal. I have no doubt that ACT or any compost tea adds nutrients; that, for example, could be one reason for your treated plants’ good growth. (I know you added liquid organic nutrients to your “control” plants, but was the nutrient level and spectrum identical to that in your compost tea?) Many experiments by reputable researchers have failed to show benefits of ACT. No need for me to reinvent the wheel. Dissing compost tea is not a cop out on organics. The foundation of organic agriculture is carbon compounds. Carbon compounds, which are food for soil organisms, are bulky organic materials, that is, things that are or were living. Compost tea contains little carbon as compared to any bulky, organic material. The jury is still out. I’m trying it more methodically. Updates will follow.